We work the farm year round, tending the fields, the livestock, and the gardens. Working together, the farm is not just a job or a place to work, it is a way of life. One that we would not willing give up. It is a great place to raise our family and instill the values we want in our children. That is why we work so hard to be here. Because we believe in it. Our family and friends come from all over to visit. Even as far away as the U.S. Dan's parents still live here on the farm too. Our family and the farm go hand in hand. 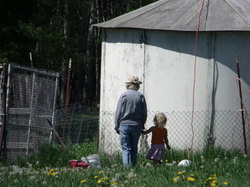 The farm is a fifth generation working farm. It started as a family farm, went to a dairy mixed farm, then to a grain farm, and now, back to a mixed family farm. We grow crops and raise beef cattle, pigs, chickens, waterfowl, dairy cows, dairy goats, rabbits, and our children. There are few things we dont grow or raise these days. We sell our products we make on the farm and at the farmer's markets. We farm as close to how our great grandfather farmed with the knowledge we have. We know what goes into our feeds and the quality of meat or eggs that we will get from them. Everything here has it's purpose. It isn't all work and no fun here on the farm. Isn't this everyone's favorite thing? Fun!!! Fun is described in as many ways as there are people. I say, fun is meant to be had. If you don't want to wash down the cow that day, get someone to help, it is always more fun to have a water fight and get the cow washed then to just do it alone. Together, most things are more fun. Getting the kids involved just makes it all that more comical. Have you ever listened to the things that come out of a 3 yr old's mouth? WOW! Adding a baby and a puppy playing in the yard just adds to the mix. Then there is watching Dan TRYING to catch an escaped chicken. It only adds to the laughs when the three yr old is the one that comes up the winner with chicken in hand. Then you add in a 6 yr old that thinks she is always right and knows it all. Well, there are interesting conversations, especially with people that visit the farm! As the kids got older we learned the hard way. They will say what they know and think. No matter who is there. If you do not want an education in livestock, do not as the kids! Click here to find our blog. It is all about us trying to get the farm back to what it used to be. To see our periodic updates of the new things we are working on here on the farm, please click here. Here is our Facebook page for the farm. You can see what is hatching, growing, or being built.